If you follow me at all on pinterest you will know that I have an obsession with white kitchens. I just can't get enough of them. They always look so clean, light and airy. They go with anything! Here are some of my favorite kitchens and why I love them. This and the next kitchen (also by Jennifer Dyer) are I think my dream kitchens. I love how crisp everything is. Nothing is too fussy or ornate. Just simple clean and classic. Both of these kitchens looks so cozy. I can just see the entire family hanging out! I especially love how this kitchen has a stained island. 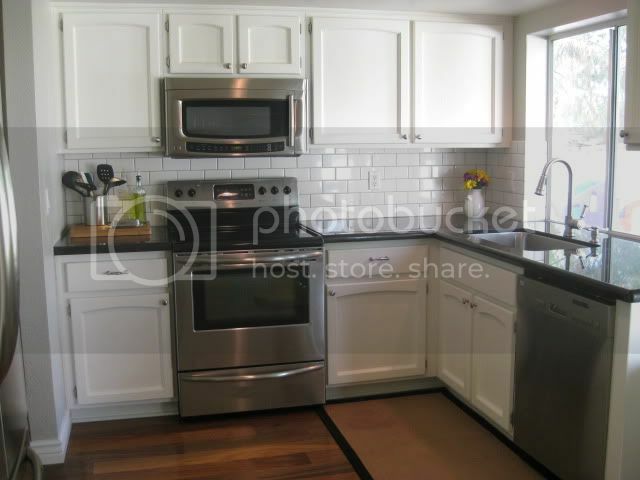 My other favorites are the glass front cabinets and the mushroom colored countertops. This kitchen by Caroline Decesare (a local gal!) Is stunning! I love the glass display at the top of the cabinets. It helps to fill more of the expanse of the room. The working island next to the eat in table is fabulous! If I had the room I would do that exact layout. I love the simple clean slipcovers, great for tossing in the wash once a week! One of my favorite parts however, is the table lamp on the right side. You wouldn't think to add a lamp in the kitchen but it brings a cozy feeling with it and I am sure provides some great soft lighting in those early morning hours or late at night. This final kitchen by Samathan Pynn is a great example of simple basic black and white color pallet. This kitchen will look "fresh" for years and years.With very classic elements you can feel free to do small changes (painting the walls, lighting, art, accessories, chairs) and totally change the look of the kitchen. I think this particular kitchen is even from IKEA. Good news for those of us counting our pennies! I hope these images have inspired you for updates to your own kitchen. I know I have some new ideas! I love white kitchens too. My new house has a white kitchen and it is pretty much what sold me on the house! Love the white kitchens you shared! You had me at white kitchen love...I can't get enough!! The second one is a favorite with the great pendant light, marble countertops and window seat...sigh...thrilled to be your newest follower!! Thanks for following! Love your plans for the beach house! Hey! Just found your blog! Great kitchen inspiration! I will be adding you to my list! Thanks for the add Nicole!